Hi everybody, my name is Elena and I have been working as an intern at Proboscis since mid June. On Proboscis’ website I posted some reflections of mine initially taking inspiration from a visual essay I am composing on the wall of the studio. The visual essay combines some impressions sprung from the observation of Proboscis’ work and some scattered ideas about geography and identity, the relationship between private and public spaces and the anatomy of the city. I’ll be posting some brief thoughts on inspiring books, remarkable exhibitions or curious places I think are worth sharing. 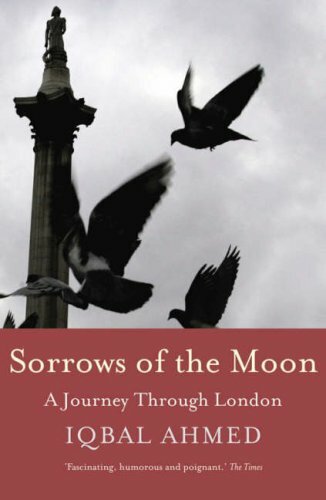 In response to Hazem’s post about Night Haunts: A Journey Through the London Night, I’d like to recommend another penetrating and poetic book which draws a personal trajectory on the map of London, that is Iqbal Ahmed’s Sorrows of the Moon: A Journey Through London, which explores petty story-lives of peripheral characters, often marked by resignation, loneliness, failure. This dominant tone of melancholy blurs and dampens the enthusiasm and the celebration of London diversity, underlining how the common destiny of the capital and of all the people inhabiting it for one reason or another is one of sorrow and isolation. Observed on a clear night from Parliament Hill, the moon, which acts as the unifying image across the book inspired by a poem of Baudelaire’s Les fleurs du mal , wraps and encloses the city in a fate of sterility and desolation.